It's blogmas time once again, which for my readers who aren't aware, is a little tradition each December amongst the blogging community to post 24 Christmas-themed blog posts in the run up to the 25th. I was originally planning to do it, but my preparation is a bit naff so instead I'll just be doing a few christmas-themed posts. 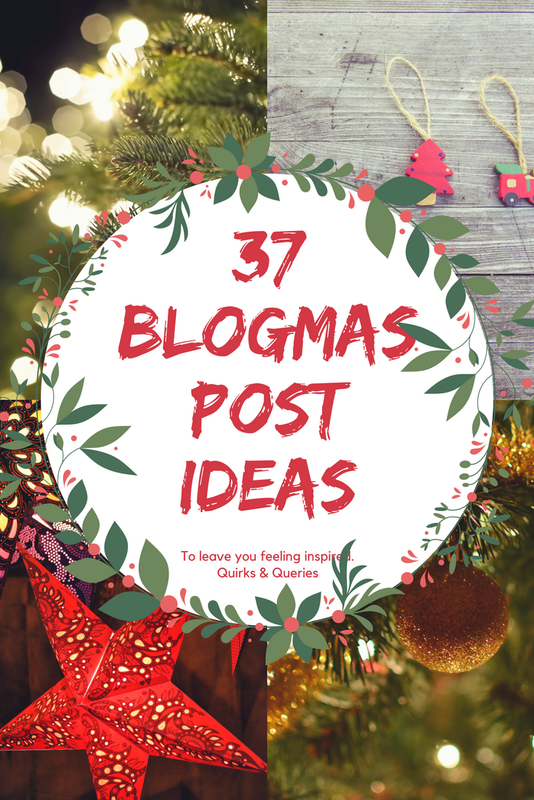 Anyway, here's 37 blogmas post ideas to leave you feeling inspired. What you love about Christmas. Share a Christmas Recipe that you love. Suggest new Christmas traditions for your readers. Alternative ways to spend Christmas day. How to save money at Christmas. What you dislike about Christmas. Review a Restaurant's Christmas menu. A look back at your goals for this year. Your favourite Blogmas posts from other bloggers. Your favourite vlogmas videos from vloggers. A day out at a Christmas Event. Hopefully, that's got you feeling inspired. Let me know in the comments if you're doing blogmas this year and leave your link so I can read yours.